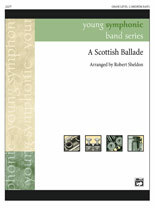 A Scottish Ballade is a setting of the traditional Scottish song, "Annie Laurie," which was written by her sweetheart, William Douglas in the 19th century. The song became a favorite of Scottish soldiers during the Crimean War. The well crafted and expressive scoring will make less-experienced ensembles sound their best.